A van driver has been taken to hospital after he was injured during a hijacking in Carrickfergus, County Antrim. He was ordered to drive to the Glenclairn Road in North Belfast where the contents of his van were transferred to another vehicle. 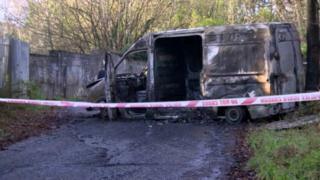 The driver was attacked and his van was destroyed after it was set alight.